Over the past few decades, it seems like you can get anything you want, at any time of day. That’s been true for years in large cities like New York and Chicago, but that’s becoming the case in smaller metropolitan areas and even in small towns. While some people complain about the need for 24-hour restaurants, gyms, and grocery stores, there are good reasons why emergency restoration services are available around the clock. Disasters have absolutely no sense of timing. They seem to be firm believers in Murphy’s Law – anything that can go wrong will go wrong and at the worst time. A fire can happen in the middle of a party when a breeze blows a curtain into a candle or someone trips over a decorative sconce. Firefighters will arrive quickly to extinguish the flames and rescue anyone trapped inside, but they leave once the fire is out and somebody has to deal with the soggy, charred aftermath. 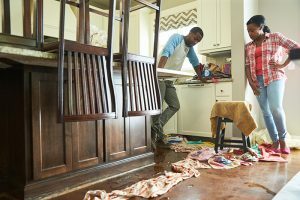 You already have to work with the insurance company, find accommodations if the fire was bad enough, deal with a rollercoaster of emotions – you don’t need the hassle of cleanup! The cleaning products and equipment you have on hand aren’t up to this kind of extreme cleaning, and rental companies aren’t open in the middle of the night. The holidays and summer vacations mean more guests in and out of your home, which mean more showers, laundry, and dishes. More people in the house mean more chances of the toilet being clogged or the bathtub overflowing because someone didn’t keep an eye on the water. You might not have had a child in the house for years, but a small visiting family member can remind you just how easily a toy can clog a toilet. The added strain on your drains or septic system can lead to a water (or worse, sewage) backup at the most inconvenient time. 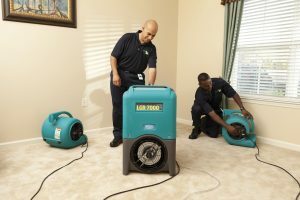 Commercially available cleaning equipment and products can’t handle a sewage backup and most people don’t want to take on water damage cleanup themselves. Sewage backups should be left to professionals, due to the risks of dealing with biohazards without proper training and gear. A rusting water pipe doesn’t care that you’re on a long-awaited vacation out of the country; it will pick that precise time to burst and flood your home so you return to flood damage that may or may not have mold growth. Instead of relaxing and easing back into work and school, you have to rush around trying to mop up excess water. Even worse, cherished possessions may be waterlogged and building materials may be damaged enough to require restoration or replacement. In these cases, it’s vital to call for 24/7 emergency services as soon as the damage has been noticed. The damage will only get worse as time goes on. Mold growth begins in as little as 48 hours after a water leak; it only needs moisture and a food source to grow. Most homes are full of food sources, like paper, textiles, and organic material. Once mold starts to grow, it moves quickly and can spread undetected in areas like walls and ductwork. By that point, people may not know they have mold in their walls until they experience a cold they can’t shake and discover they have a mold allergy. It’s equally important to call for emergency restoration services in the aftermath of a fire. The chemicals used to fight a fire can cause damage to items that weren’t affected by the flames and heat. Soot can etch and tarnish household surfaces and the damage can be permanent without timely restoration. Smoke can travel much farther than fire and items that weren’t burned can be heavily damaged by smoke. Without professional restoration, these items can’t be saved. By calling an emergency restoration services company immediately, you save yourself a great deal of trouble, both immediately and in the future. They have the training, equipment, and products to provide comprehensive disaster remediation, freeing you up to deal with insurance, manage guests, or take a minute and wonder what just happened. 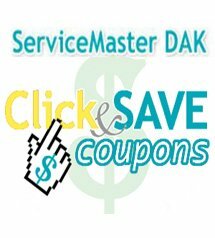 No matter why you need emergency water damage restoration or what time of day, call ServiceMaster DAK. We provide 24/7 emergency services for residents of Northbrook, Wilmette, Glenview, Highland Park, Lake Forest, Winnetka, Buffalo Grove, IL and surrounding areas. With over 40 years in the business, we know how to manage a disaster. We’ll inspect and assess the area, extract the water, and completely dry it to prevent mold growth. Our technicians will take daily moisture and humidity readings to ensure the water is being removed. We work with your insurance company to handle your claim as quickly and efficiently as possible. Water and mold remediation costs vary, depending on the extent of the damage. Watch the video provided from ServiceMaster Restore for more information.